A single platform to effortlessly collect, analyze and close the loop on product feedback with customer bases and internal teams of any size. "Good user experience with lots of potential for innovation"
UserVoice has a pretty good user experience overall however, there are always improvements to be made. I love how willing UserVoice is to work with us to solve problems surrounding feedback collection at our company. I feel we have developed a partnership with the team at UserVoice that allows us to be candid with our feedback on the product and in turn, we see improvements to the tool that directly impact our experience. UserVoice has a lot of great updates on the horizon and I love how they include us in the conversations that shape these improvements. Custom reporting needs a lot of work. We house so much important information in UserVoice but it becomes a pain to analyze when we have to employ the use of a third-party reporting program. Would love to see more custom reporting and user session reporting in the future. UserVoice provides us with a central hub to track the majority of our user feedback. It's super helpful that we can access feedback coming directly from users, as well as feedback captured through the Contributor function by our internal teams on behalf of our user all in one place. UserVoice also provides us with an easy way to update interested users on new feature releases and innovation. We also use UserVoice to locate more clients willing to participate in discovery discussions and beta testing. The value in the ability to reach a number of individuals subscribed to an idea with one message is absolutely incredible not to mention a huge time saver! The analytics to help us determine what is most important to our user base is key - it removes the assumptions from the equation. We have some industry specific parameters that cannot be accomplished in filters for our end users that they are used to. I think in the long run this will work out but we're hitting some resistance with our customer representatives. If you are a company wanting to tap your end users for ideas and provide direction based on their feedback this is a great tool. We've had nothing but positive experiences with the team of people we've worked with at User Voice! We're excited to see what the future holds! We are opening up the voting capabilities to the masses - previously this was limited to only a select group of end users. We are hoping that will provide a truer representation of the important features we need to focus on. We are early into our journey but the analytics are going to be huge in helping us determine and define our road map! What Enterprise Feedback Management solution do you use? "UserVoice has taken our Product Development backlog management to a whole new level"
We love the added value that UserVoice provides us compared to our competitors. It shows our users that we truly care about their feedback, and want to know how we can make our products better. From an internally facing perspective, we love how organized our backlog is now. Managers from any department can track the progress of a certain feature or request, and communicate with their employees and customers accordingly. The Product Development team spends more time improving product, and less time answering questions about backlog. The ability to display a concise product roadmap, and report on the progress of various projects has been very beneficial as well. Nothing yet! But we are still getting used to how everything works. Improved communication with managers in other departments. Improved communication with other customer facing departments within the company. UserVoice has streamlined the way we communicate, and has encouraged other departments to be more engaged in providing feedback. "We love UserVoice, our Clients love uservoice, huge improvement to our feedback loop! " The best part of UserVoice is getting more and consistent feedback from our users. Right away we had things that got voted to the top that were not even on our radar from client conversations/interviews and other internal feedback. Gives me a pool of people invested in our product to contact for interviews and digging into the 'why's' around their requests. Our internal folks love it as they have somewhere to point our users to that they know will get them heard without them having to be the go between. We have an annual conference, and i had numerous clients come up and tell me that they absolutely love UserVoice. The main struggle is getting the time to keep on top of it, we get so many ideas! The dashboard doesn't give me much information, may be due to our set up, I always head right into a view of the ideas so would love to be able to bypass that page. Compare to others out there and you'll easily see how UserVoice is the best at what they do. Talk with those using it already-a lot of advantages! Also, be sure you have a plan on how to handle the ideas coming in. UserVoice provides a lot of great tools to help you manage ideas. Getting more and better feedback from our clients, and being more transparent with ideas submitted to us. Used to feel like a 'black hole' for clients that gave suggestions and we had to try to manually figure out and get back to those that suggested it. We don't have to ask our operations and sales to answer 'well how many are asking for this' to which the answer was always 'a lot'. Benefits have been a better pulse on what's important to our clients, quicker feedback on changes we make, early adoption of new features by those who get the update that we've released a feature, and our clients feel heard. Hi Megan- thanks for the feedback! What kind of information would you find helpful on the dashboard? We can definitely look at working with you to determine what is more useful and help update the grid if necessary. As for bypassing the dashboard, yes, we'd agree with you here - it's not currently prioritized on the roadmap, but we'll be sure to followup with you when that changes. "A better way to engage with your customers"
UserVoice focuses on the feedback loop between product management and customers. This is the reason our organization choose UserVoice. When customers submit ideas, they don't get lost in some black hole. UserVoice provides a framework so that Product Management can engage with customers on those ideas and keep customers up to date as to what is happening with those ideas, even if it meas those ideas don't align with our organizations strategic vision and are declining to move forward with those ideas. UserVoice is a great platform and is always improving, but sometimes the features feel a little less polished than others. What nice though is that every time I have reported a bug, they have been really prompt at investigating and fixing it, usually within just a matter of days. We previously were using Zendesk to track our ERs, but we weren't using Zendesk's ideas forum, instead we were using support tickets. This meant that we were able to communicate with our customers well about ideas, but we didn't have any reporting or de-duplication. What we are loving about UserVoice since we went live last month is that our different customers are able to collaborate on the same idea and our disposition for different ideas are public for all of our customers. We were able to integrate with our existing identity solution so our customers didn't need to register for another account. We were also able to control our Access Levels to make sure that our entire customer ideas portal required authentication, we didn't want anything open to the public. Hello fellow Aaron! Thanks for taking the time to write a review and for submitting bugs that you find. I'm sorry that you run into them in the first place, but am grateful we're able to work with you quickly resolve these issues. Is there a particular feature or features that currently feel less polished to you? I'd love to get this surfaced with the team. Thanks again for the continued support! "Quick and Actionable NPS Insights!" I love the NPS tool and insights - you can easily see whatever you need with your account. We look at NPS monthly, as well as quarterly and annually. I'm able to pick and choose what I want to see. I export the comments, which is generally a very quick process with a nice and clean excel file. You can immediately see promoters, detractors or passives and select several ways to view the NPS information. Nothing, at this time! We are using it for NPS and Feedback/Feature Request collection and I think they do a very good job of making the system work easily for us! The NPS and Feedback collection tools are really fantastic. The system is very intuitive to use and if you're stuck, their support team is fantastic! We use UserVoice mostly for NPS collection - I look at the scores and comments monthly. Our customers comment 30% of the time to explain why they chose their NPS response; while other platforms we've tried out, resulted in less than 3% of response-rate. It gives us the reason behind the score so we can work to improve their experience. We also use UserVoice to track feature requests. I find it easy to create my own, manage and update tickets/requests that come in. Its very intuitive and easy to use -- merging ideas, editing, updating the followers. I also find that we get about a 70% open rate when I message followers with an update, which is amazing! "Having a single place to aggregate and quantify mass amounts of feedback is critical"
The best is being able to simply organize and aggregate feedback from all sorts of sources in one place. Without UV, i'd have to figure out how to do this manually, and frankly, it just wouldn't get done. Being able to additionally combine CRM stats with the data to characterize and quantify and business opportunities is great. Search is still an issue - we have a lot of single vote suggestions where a lot of the time, there's an existing suggestion it should be merged to. The amount of time it takes to do it isn't worth the effort, so if we can just get to the 80/20 rule (make sure a majortiy of the higher vote suggestions are appropriately represented), thats fine. To do this, i'd ultimately like to be able to sort search results by # of votes so i can review higher impact items first and not have to wade through all of the one-offs. We've had so many sources and conflicting reports of "the top feedback items" internally that UV now gives us a single source of truth without having to sit down as an entire product group and reconcile what we're all hearing. Yes, that will happen anyway since UV is only one channel with only so much engagement from our user base, but it's a huge part of the puzzle. Hello - thanks for the review! One area that we're currently investigating is for the system to recommend suggestions that could be merged and to notify supporters that may be interested in a suggestion. The goal here is to reduce the admin burden of managing your feedback. Does this sound like something that would help you address your current pain with search? "Great product for growing companies!" UserVoice is a great platform for capturing customer feedback and suggestions. We're able to qualify and quantify customer responses, making it easier for us to determine priorities for product development. It easily integrates into our daily software like JIRA/Confluence and Slack. It would be nice to be able to customize the front-end that users see, as the current set up does not match the rest of our website exactly. Make sure you utilize the robust reports features via the admin panel! As a customer advocate, this is the best way for me to capture feedback and suggestions. Customers feel comfortable knowing we've dedicated an entire portion of our website to their feedback. Thank you for taking the time to provide us with this feedback! What kind of customizations would you like to make to the front-end experience? I'm happy to have our team jump in and help out. Feel free to shoot me an email directly and I can loop in the write folks - aaron.lapierre@uservoice.com. "Excellent system to collect and monitor customer feedback"
Having all our customer feedback in one place makes it easy to prioritize which ideas we should consider implementing. The API is also extremely useful; we built a Slack app that allows our support reps to enter ideas on behalf of customers with a simple slash / command. Overall it's a great system, just wish it was a bit more flexible in exporting and reporting. We use it to keep track of top feature requests. Then, when we decide to implement one, we use it to contact the "supporters" of an idea for customer research like surveys, usability studies or inviting them to the beta. Hey Uhl- it's great to hear from you! Thanks for taking the time to provide us with a review. What kind of flexibility in the exports/reporting would be helpful for you? 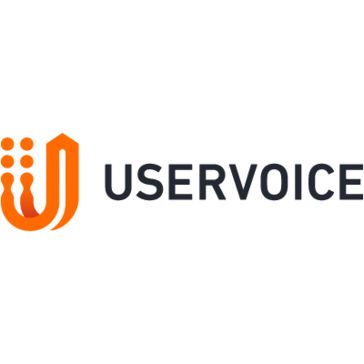 "UserVoice has been at the heart of our feedback revolution! " UserVoice provides our customers and stakeholders an easy to use platform to share their ideas whilst giving our Product Managers the data to make the right decisions. The ability to customise to our corporate look and feel ensures we can give our customers a familiar look and feel. Would like to be able to customise the look and feel of the admin component (as you can with the end user views). Improve the ability to interact with end user/customer records. Our organisations user ideas and input platform is provided by UserVoice. This has allowed us to make the right decisions at the right times. Thank you for submitting a review- we really appreciate it! Digging into your feedback a bit more, what would you like to customize within the admin view? Additionally, we've just released new 1-1 emailing to follow up with customers that leave feedback. Does this address your second point? Or is there something else you'd like to see here? "It's time to leverage your product management"
UserVoice is not only a great tool to manage clients request and communicate with them. It also helps the product management team to communicate with others in a company. It helps to analyse and visualize this communication. I like the constant updates, a great knowledge base. The most amazing part for me that guys are using their own tool for their product management. Sometimes it's hard to navigate in so many coloured numbers on the screen. Constant communication with customers. Planning roadmap, not only by feelings but numbers also. It is a really smart and powerful tool of analysing and visualizing insights. Thank you for taking the time to provide us with a review! To clarify, are you referring to the Ideas view? Or is there another spot that you'd like to see cleaned up? Let me know and I can get that feedback logged with the team. "Good funnel for customer feedback"
Uservoice is a good in-app product to gather user feedback. There are multiple options for how to handle the feedback -- each submission can create a ticket or just feedback. IT's easy to review items and disposition them. Also, the idea portal is pretty good. There can be a lot going on in the interface. I'm still getting used to the new UI. There was so much stuff going in that everything got unruly. Now we are trying to get back on top of it. I like being able to source feedback from users and with barely any extra work, get it to the right departments and create actionable tasks to improve the product. There should be an iPad app or something to make the dashboard more portable and accessible on the go. Organization is key. Take advantage of the dashboard tools and stay organized from the beginning to make the most of it. Getting feedback from users and customers. Acting on that feedback in the right departments. Hi Brendan-- thank you for taking the time to submit a review and provide us feedback! I've gone ahead and captured your request to have a mobile experience for the admin console. We haven't yet seen much traction for a mobile version from our customers so it is not currently prioritized. Should that change you'll be hearing from us. "Great system for collecting and organizing user feedback "
The contributor sidebar makes it so easy for anyone at our company to log feedback from a user without having to log into a different app or website. Some additional options for styling the end user site would be a big plus. Very satisfied with the product and level on onboarding support. Is there something in particular in the styling that you're trying to achieve? Feel free to reach out to me directly (aaron.lapierre@uservoice.com) and I can loop you in with someone on the team to help you with the css. "Good for busy product teams"
UserVoice helps me stay on top of the hundreds of requests that come into my product portfolio every week. I like that I can easily merge and group similar requests, so that I can get a holistic overview of all the feature requests that exist for themes in my area. We use it internally only, so it helps for our customer success team to have more visibility into the status of requests. I almost definitely do not use it to its full capabilities. When a request doesn't have a status, this is how I know it needs to be triaged. There are some annoying things in the app like the fact that the status column doesn't save in your cache, so every time you need to go do triage, you have to update the filters in order to continue. You also can't bulk-move multiple requests into a different category -- for a sprawling product that relies on customer success teams to capture feedback, not everything winds up in the right spot. UserVoice helps us stay on top of a deluge of customer feedback, and gives our customer success teams a medium to get important feedback to our product team. Our goal is to help increase transparency between the two departments, and UserVoice so far has been helpful in doing that. Hi there-- thank you for taking the time to provide us this feedback! Regarding the status column not caching - does creating a custom view and saving that solve this challenge for you? You can create a view filtering for 'Public Status' equals 'No Status' and then saving in the top right corner. If not, would you mind clarifying a bit for what you're trying to accomplish? For bulk moving Suggestions, you're able to multi-select ideas and then move them to a new category by clicking on More Actions > Move Suggestions. From here, you can select the Forum or Category you'd like to move the Suggestions to. Feel free to reach out to me directly if these don't solve your challenges - aaron.lapierre@uservoice.com. What I like best about Uservoice is the ability to customize the platform and have an in-app widget for feedback. The custom front end isn't super user friendly. We needed to wait on developers to customize our Uservoice instead of being able to do it ourselves easily. One of the greatest parts of Uservoice is that you can organize your feedback really easily to dispatch to the development team. We can check quickly which features have been sent and which will be developed. We're able to create a large backlog of product ideas and features to develop thanks for the feedback received via Uservoice. Hello! Thank you for the review - we really appreciate it. I'm sorry you had a difficult time with the front end configuration during your implementation. We typically offer professional services for portal design so we haven't invested heavily in a WSIWYG editor experience. Don't hesitate to reach out to us in the future if you'd like any help on making updates to your portal design. By providing a great suggestions portal and suggestion widgets that go into our software, useful roadmap planning functionality and NPS (Net Promoter Score) polls all in one software, we get a much better picture of what our customers think and what to focus on in product development. Integrations to other platforms could be easier. We are currently exploring integrations to Salesforce and some other services but its not exactly as easy as we had hoped. You need a product team and good processes in place to get the most value out of it. Thank you for the feedback! What challenges are you running into with the Salesforce integration? Feel free to shoot me an email as well (aaron.lapierre@uservoice.com) and I can see what we can do to better assist you. "Business Analyst with 25 years IT Experience"
User Voice has allowed us to receive great feedback from our more than 800 offices worldwide. It is simple to use and easy to deploy. Would like to see more flexibility on the settings of the system. Would like to see more options on available templates. The reveiw process could be simplifed by doing more automatic grouping by needs to be reviewe etc. Easy off the shelf templates if that meets your need. Easy way to receive feedback from Users across the country. Allows our offices to have input on direction of new products or enhance current offerings. Thank for taking the time to provide us with this review! What kind of flexibility would you like to see out of the settings? Is there something in particular that would make your job easier? Similarly, what types of options would you like to see in the forum templates? Lastly, for automatic grouping, we're starting to explore functionality to recommend merges of suggestions. If you're interested, we've love to set up a call to see if this is something that is of benefit to you. Feel free to shoot me an email directly - aaron.lapierre@uservoice.com. "Best way to get user feedback at scale"
Its difficult to get a view on trending feedback at scale. Uservoice helps me reach to a very large portion of our customer base with ease. Often some features or ideas require some further comments and discussion. I would like to engage more thoroughly with some of the comments. Threaded conversations in ideas would greatly help in this area. I use Uservoice to identify trends in feedback and validate customer requests at scale. Using Uservoice, I can get in contact with more customers about specific needs and feature requests. Uservoice helps me find those passionate users. We've just launched new 1-1 emailing so that admins can directly follow up with users to dig into their feedback further. All messages will appear in the context of the suggestion in your admin view. Hopefully this helps resolve some of your challenges here. Let me know if you'd like to discuss further, or if there's something else that you'd like to see. "Valuable Feedback as Business Changes"
As our products and services change we can keep our finger on the pulse of the customer's experience. I would like the ability to obtain more specific user information however in the age a GDPR that may be a challenge. UserVoice is assisting me to find and eliminate broken links, outdated article content and customer pain points. Thank you for the feedback! What additional user information would you like to see in UserVoice? If it helps, I'm happy to have our team talk to the appropriate folks on your end if there are concerns around GDPR. Feel free to shoot me an email directly and we can set something up - aaron.lapierre@uservoice.com. "UserVoice makes managing customer issues and suggestions easy!" UserVoice's backend makes it really easy to assign customer issues and suggestions to the relevant stakeholders. Seems to be some sort of bug with the new user invitation system. Many times I have sent out invites for new users and even after they check their spam, they don't get the invite. I typically have to re-send the invite multiple times for them to finally receive it. Mainly replying to issues that customers have with our large number of web services and managing the volume of suggestions that we receive for those services. Hello - thank you for taking the time to leave us a review! "Bringing sanity to the prioritisation process"
Hi James- thank you for the great review! We really appreciate the feedback. Digging into your Salesforce integration issues - what challenges did you run into during implementation? Additionally, what would you like to see added to the functionality? I really like the flexibility of the UI and the ability to understand fast the current needs. "Great way to collect and analyze customer feedback"
We're very happy with UV. We've used it for over 4 years to collect feedback from our users about what they like and don't like about our product. Users find it accessible, and it is a great way to remain engaged with them. UV is smart about proactively asking users about their tastes and preferences and the data we get really helps us understand where trends are. We've never adopted UV's ticketing system for customer support. It didn't have the power we were looking for. Your ideas forum won't help you if users can't find it. Optimize your app's user experience to promote idea feedback in order to make sure you capture their feedback. We wanted to get feedback from customers and let customers "collaborate" publicly amongst themselves by voting on other users' feedback. That feedback has always been a big part of our roadmap planning. "Uservoice helps us to really understand what it is our customers want"
A single place for all feedback and ideas, giving us the ability to respond and react quickly to customers. Customers often ask how they can see what ideas they have submitted, so they can easily see stauts and they like to have a unique tracking number. One of our goals is to have the customer at the center of everything we do. With Uservoice we are able to more customer-centric across all Ivanti products. Thanks for taking the time to submit this review! We really appreciate it. Your customers are able to view their feedback by clicking on 'Settings' in the web portal. Here, they can see the suggestions they've supported, click through for status updates or change their notifications settings. We don't yet have the notion of a tracking number on suggestions, but I'll be sure to log that feedback with the team. "UserVoice time saving and easy to use"
Having all of my customer feedback in one place making it easy to manage and reply to multiple users at the same time. Easy to use, time saving, gives us better insights into our customers needs. Keeping customers informed and thereby invested in what we are building. Hello- thank you for the review! What kind of auto messages would be helpful for you? I'd love to get more detail here so that I can surface it with the team. "Ability to accuratley track and respond to feedback"
I like the ability to track and respond to feedback. I like the fact that feedback can be ranked to help priortize workloads. I would like there to be a dark theme, so that I can not strain eyes when switching from dark theme apps. Its a great tool to help track and manage feedback. The ability to track, rank and respond the feeback on services i own. Hello- thank you for the review and feedback! I've captured this request and have shared it with our Product team. Thank you for providing us with your feedback! We really appreciate the time. Are there particular areas of the admin console that you'd like to see improved? Or is there something specific that would make your job easier? "Feedback management service with some useful features for product management"
Backend is not mobile friendly and there is no mobile app. No way to navigate from feature to related suggestions (at least I failed to find it). No rich text formatting in suggestions. No way to split suggestions or move supporters from one suggestion to another. Does not expect too much from product management tools of UV. Learn how to work with suggestions: merge, group, organize. Otherwise in a year you'll get an unmanageable amount of unrelated topics. Hello- thank you for providing us with this review! - Mobile backend: we haven't had much demand for this to date so it has not been prioritized. I've logged your support for this request. - Navigate from Feature to Suggestion: when you click into a Feature there's tab for 'Feedback' this will show you all related Suggestions to the Feature. As a side note, we're starting to plan a redesign of our detail views. I'll make note of this particular usability issue for the team. - Split suggestions: we don't currently have plans for this on the roadmap. I'm happy to have your Customer Success Manager discuss some best practices to help mitigate this problem. Thanks again, and let me know if you have any additional questions/concerns. "Platform approach on getting actionable insights for products"
I like the platform approach of Uservoice where customers/users of a product have the ability to express their feature requests at one hand but even more to see requests already raised from others where they have the ability to up-/downvote and discuss around it. I'd love to get this feedback surfaced with the team. Could you help me understand more what you find difficult with multi-language support? Letting users vote on threads is really beneficial when filtering and prioritizing what problems to explore further. the ui and controls are a bit scattered. identify issues to explore further with customers. Thank you for submitting your feedback- we really appreciate it! To dig into your feedback a bit more, do you have any examples of where you find the UI cluttered and would like to see it cleaned up? I'd love to get this over to the team, so any additional info you can provide me would be greatly appreciated. "Good product and really great customer service"
Hi- thank you for the feedback! We really appreciate you taking the time. We haven't yet prioritized multi-tenant authentication support, but we're happy to discuss this request further. Feel free to drop me an email and we'll get a call scheduled with the right folks -- aaron.lapierre@uservoice.com. "UserVoice - Modern Requirement Management and Priortization System"
It is challenging to aggregate metrics. Customized reports will help create hidden insights. Hello - thank you for providing us with this feedback! I'd love to dig in more to your challenge. What would you like to see out of the reporting? "Streamlined, effective, comprehensive, easy to use"
Internal idea gathering; UserVoice amasses that effectively and timely. I've been working as a Product Manager on various SaaS platforms, and over the past 3 years UserVoice has played an essential role in guiding my product decisions. The array of tools they offer really makes it easy to collect user feedback in a less intrusive way. Most importantly, end-users love the feedback UI, too, and seem to keep continue engaging without me having to solicit feedback over and over again. I've tried other solutions out there - Zendesk, GetSatisfaction, IdeaScale... Nothing worked as well as UserVoice. * We monitor all UserVoice reviews to prevent fraudulent reviews and keep review quality high. We do not post reviews by company employees or direct competitors. Validated reviews require the user to submit a screenshot of the product containing their user ID, in order to verify a user is an actual user of the product. Hi there! Are you looking to implement a solution like UserVoice?